Garth Jennings director of Hitchikers Guide to the Galaxy brings this joy filled tale set in the 80's in England about two young boys from opposite upbringings come together to remake their own version of Rambo First Blood. This film made remeber how fun it was to be a kid. It brought back how much impact films like Rambo, Jaws, Star Wars, etc had on us as kids and our imaginations. It is a very light-hearted comedy that pays back with endless laughs and enjoyment. All of the characters provide good laughs and keep the film moving at a great pace. Didier the french exchange student is perfect and his crew that follows him around provided laughs at the old 80s hair and clothing. 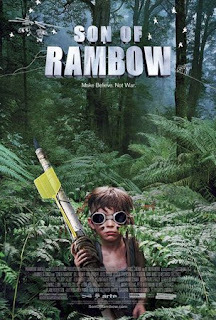 All the way through Son of Rambow provides fun for the whole family and also a great remeberence of our childhood and the joys of R rated movies. The action sequences produced by the children are quite good and sometimes hysterical. The sets and scenery they use for the film is done in that childhood manner so well. All of Will's illustartions and dream sequences are rad and add to the overall enjoyment of the film. Most of all the film delivers in heart as well, not in a sappy way, but in a way that makes you smile and feel good.